Looking for the best sharpening steel may be a hard task. For you to do some tasks in the kitchen, your knives should be sharp. The following steel sharpening steels are available in the market and are the best according to the customer reviews. There is a difference between a sharpening steel and a sharpening stone. The sharpening steel only maintains the edges of sharp knives. The sharpening stone can sharpen dull knives. The sharpening steel only makes a sharp knife sharper. You can use the tool after every use. This is because it removes all the fins that may be produced on the knife’s blade. The sharpening tool can be used to realign or rearrange the blade so as to keep its sharpness. If you want to purchase a s﻿﻿harpeni﻿﻿ng steel, ensure that it is longer than your knives. This will help you have a full pass with the blade of the knife. If you choose a lightweight or short rod, you will have to exert more effort and the results may not be so pleasing. Most of the sharpening steel are about 9-12 inches. You can pick the 12-inch sharpening steel for better results. For you to use the sharpener comfortably, the handle should be ergonomic. This will help you to hold it securely. Look for the steel that has a slip-resistant handle. The hand should be able to rest on the handle easily and comfortably. It should have an appropriate thickness for you to grip. Ensure that you hold the sharpener before you buy. Don’t purchase a sharpening steel with too small or too large handle when you grip it. This will help you to avoid wearing your hand as you sharpen your knife. Most of the sharpening steel are made from the high-carbon steel. Some of the sharpeners are made from diamond or ceramic steel. The ceramic, steel, and diamond can keep your knives sharp. The diamond rod is a little bit harsh for a knife that is already sharp. It will sharpen more that it hones. This can be used on any knife. 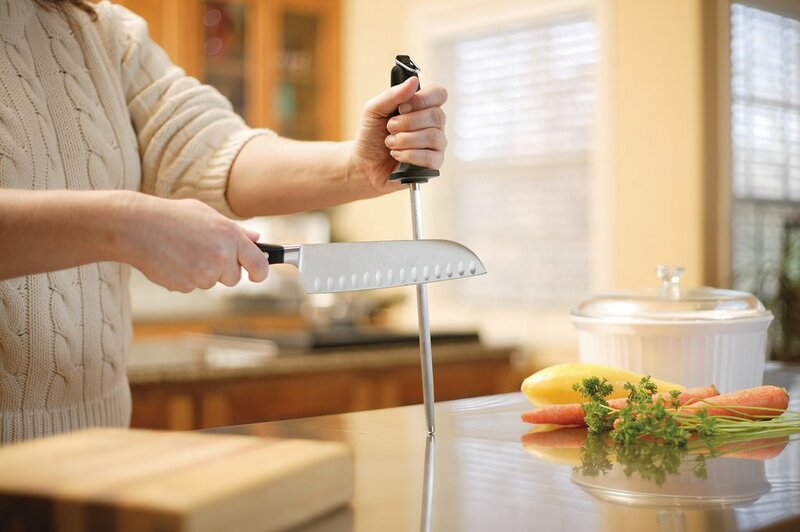 If you want to maintain your knives on a regular basis, choose the one made from ceramic or a steel. The steel rods can have fine ridges or be smooth completely. The rods that have smooth ridges may hone the edges of the knife slightly. It may wear it down faster. This is the reason why the smooth rod is more superior that the one with smooth ridges. It cannot be used on the knives made in Japan, this is because it is delicate. The ceramic rods have the best features. This can work on the knives that are made in Japan. This is because they are harder. The diamond rods are harder than the ceramic rods. The ceramic rods can clean the knives as they realign the edges. The best ceramic rod should have a fine grit which is about a thousand and above. This sharpening steel is from the utopia kitchen. 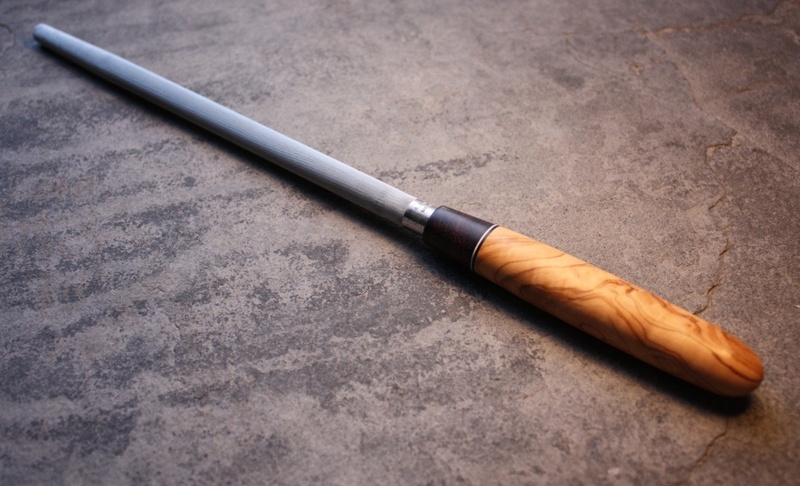 It is a 10-inch knife sharpening steel rod. It can be used on any type of knife. The knives include household, kitchen, pocket, and sporting knives. This is made of carbon steel which is plated with nickel-chrome. The surface of the rod is sharp to prevent the cutting edges from any damage as you sharpen. It is easy to use this type of sharpening steel. Any person can use it to sharpen a knife, both right and left handed people. The handle is ergonomic. It can fit in all hands easily. It is slip-resistant with a rubber bottom. It stays in place as you sharpen your knives. ​The body of the rod can be wiped easily with an oil cloth that is soaked in cooking oil. If you use water to clean it, wipe it dry and hang to dry. 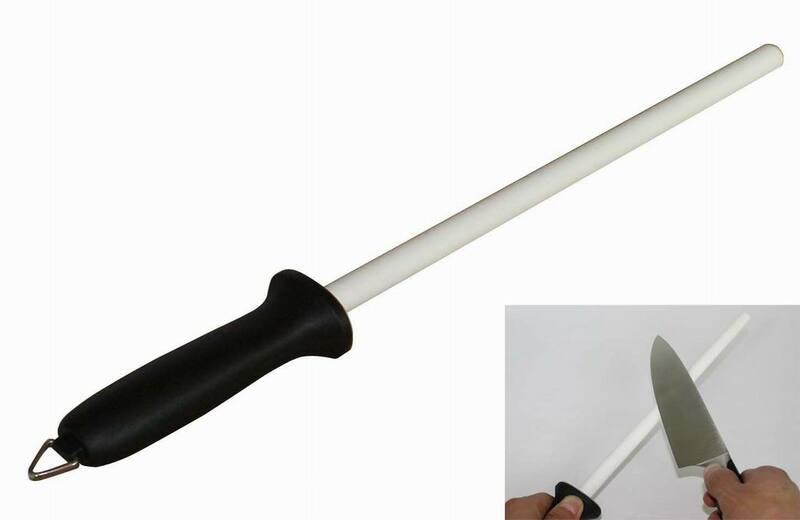 It can keep your ceramic and steel knives sharp by pulling it few minutes through precision rods. ​The rod can sharpen any knife blade. The serrated and standard edges of the blades. 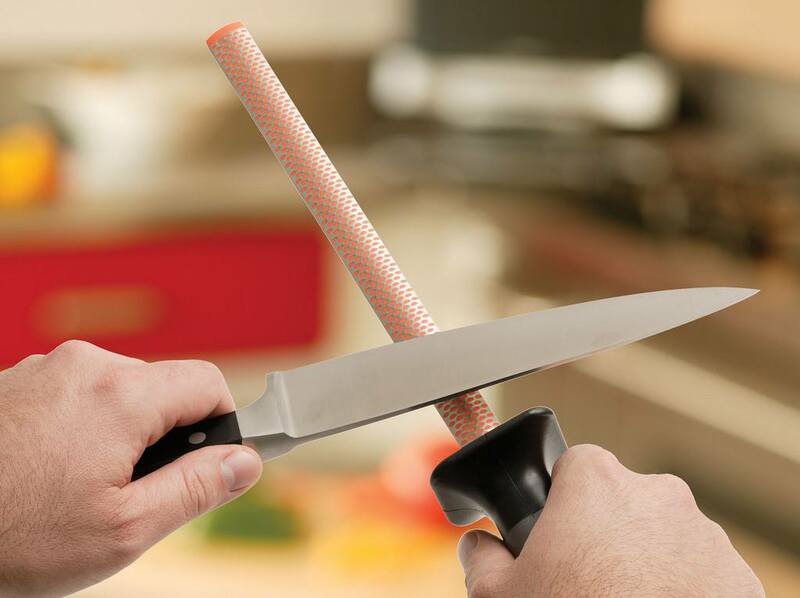 The handle is durable for safer sharpening. It is not dishwasher safe or water. It is only cleaned by cooking oil. It is produced by Winware by Winco. The handle is 5 inches long. The handle is made of plastic with a loop that is hanging. The sharpening blade is 12-inch. It is cleaned by a soft damp clothing. If you want to work easily with your knife in the kitchen, it should be sharp. There are many ways of sharpening a knife, most of them have a long-lasting effect of wearing the blades down. This makes them look ugly. The sharpening steel cannot wear down the blades. This makes a great difference between different sharpening tools and sharpening steel. ​The sharpening steel has a loop that you can hang it on hooks. It can hone and realign the knife blade nicely. The steel may not be hard enough to hone a knife. This is by the Wusthof. The sharpening steel attracts metal fibers because it is magnetic steel. The handle is slip-resistant and comfortable. It has a loop for hanging on the handle. It can be cleaned with a damp cloth after using. It is used to sharpen and realign the edges easily and quickly. It can be used daily to maintain the knives. The steel attracts metal fibers because it is magnetic. ​The sharpening steel is indispensable. It is used to keep your knives in a good shape. It has a square handle that is easy and comfortable to handle. ​It has a loop that can be hanged on hooks. It can be used on any type of knife. The steel is grooved. This may not be good for the knives. This steel is by the Henckels. It is designed to maintain knives on a daily basis. The steel is relatively affordable. It is easy to use and lightweight. It has a tapered edge and a handle that is flared. If you are experienced with manual honing, this can be the best sharpening steel for you. It is ergonomic. It can be gripped easily and comfortably. ​It has a hanging hole for hanging it. ​It has a lifetime guarantee. ​It has a good balance when using. It is easy simple to clean and maintain it. This is by the Victorinox. It has a black handle. It maintains the edges on the knives. This makes the life of your cutlery longer. It has a long lifespan. It is made of the highest quality steel. It has a cut that is continental. The sharpening steel should be used after every time you use your k﻿﻿﻿nive﻿﻿s. Ensure that you don’t use the knives on wrong cutting edges. This is because you will ruin the edges. Avoid using the knives on glass, Formica, marble, and other hard surfaces. It has a black handle that is slip resistant. This offers enough safety for the user. It repairs the damaged edges that are already sharp. It smoothens the edges and maintains the sharpness of the blades. ​The sharpening steel is affordable. It is good for the paring or the boning knife. It works well with short knives. It is not good for the large knives. According to my preference, I love the Winware stainless steel sharpening steel. This is because it maintains the edges of my knives very well. I use it after every use of the knives. This has made my work in the kitchen easier for the last three years. It can be maintained easily by a damp cloth. It is long enough to maintain all my kitchen knives. The handle is ergonomic. It is slip resistant, this makes it easy and comfortable to use. I can comfortably hang it on hooks for safety.